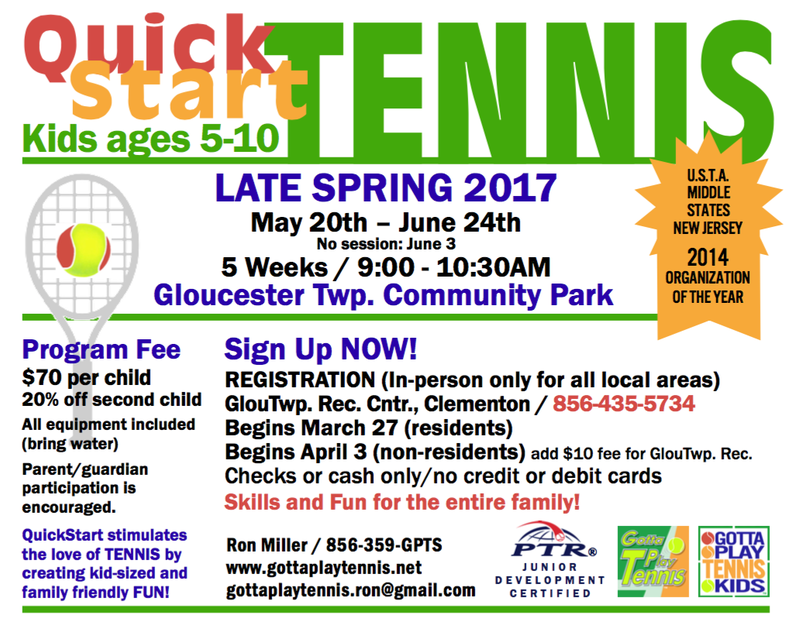 What is QuickStart tennis and Gotta Play Tennis Kids? 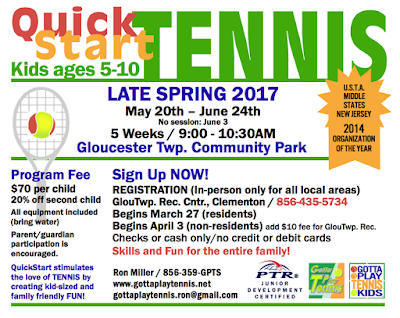 Why makes our Gotta Play Tennis Kids program special? It was once stated to me (Ron Miller) that, since parents want their kids to progress from one level to the next, the only way to accomplish this is through competition. Therefore, the concepts we promote—learning how to hit the tennis ball, move on the court, and consider basic tactics—does not lead anywhere when a score, indicating a win or loss, is not present. While not disagreeing that progress forward is always positive, and also agreeing that much can be learned in a point-oriented environment, I believe the goals of what Trish and I seek to accomplish are lost in this way of thinking. Our mission is a simple one: introduce families to the wonderful sport of tennis and provide them with some basic skills so that, as a family, they can enjoy the exercise, fulfillment, health, athleticism, sportsmanship, sibling camaraderie and family unity that tennis can provide. If our mission sounds like something that interests you, and you are someone who would prefer to interact with your children and others in sport instead of sideline-sitting and watching the action and fun pass you by, then this program is for YOU! Is tennis an individual or team sport? Let's consider the big picture. Usually the first organized competitive play for kids in recreational tennis (those not involved in tennis clubs) is the high school tennis team. This might be followed by participation on a college tennis team. Yes, individuals play against each other on the court in either singles or doubles competition. But the team concept is obviously not foreign to tennis. For example in professional tennis, countries around the world vie for the Davis Cup trophy each year as players team together in competition. The opportunity for an individual to make a significant impact on a team's success is much greater in this sport versus others since players get considerably more time in actual play. Tennis has no specific time clock, and therefore match time stretches or contracts according to the abilities of the players on-court. Games won by a singles player or doubles team add into the overall score of their school's team. Tennis is a lifetime sport! Can the same be said of soccer, baseball, lacrosse, football? Swimming was linked to a 28% reduced risk of death, while the figure was 47% for racket sports and 27% for aerobic exercise such as dance. Neither running nor football (American soccer) or rugby was linked to a reduced risk of death. Don't you owe it to yourself and your loved ones to at least try tennis? Deptford Twp. Tennis is CANCELLED for today, 5/13/2017, due to rain, wet courts, and a forecast of no sunshine and more rain. Please check back on this website for information on how we will handle this rain date.